The total camera modules market is expected to reach USD 36.95 Billion by 2020, growing at a CAGR of 10.8% between 2015 and 2020. In the modern dynamic world of technology, the applications of camera modules have expanded beyond their traditional use as a component of digital still cameras to an extensive range of markets in automotive devices, security, healthcare, and other areas, owing to the cost and performance benefits of the camera modules. The camera modules market is gaining ground in several applications from consumer electronics to industrial robotics and gaming, automotive, healthcare, security & surveillance, and aerospace & defense. With the advancement of the digital image technology, increased opportunities are growing in the camera modules market. This advancement is reflected in some core technologies in the camera modules market such as 3D depth sensing, infrared thermal technology, 4K pixel and ultra HD display technology, and panoramic technology. The global camera modules market was valued at USD 19.21 Billion in 2014 and is expected to grow at a CAGR of 10.8% between 2015 and 2020. Currently, the consumer electronics application holds a large share of the camera modules market. The growth of camera modules market is fostered by the growth in the demand for consumer electronics market globally. Also, the growing market for advanced driver assistance systems (ADAS) in the automotive sector is boosting the demand for image sensors, and in turn, camera modules. In addition, the camera modules used in the security and surveillance systems are penetrating the household security market, intelligent buildings, and outdoor security market along with the government facilities and commercial buildings. In this report, the global camera modules market is segmented on the basis of different components such as image sensor, lens modules, and others. This market is also segmented on the basis of process into COB (chip-on-board), and flip-chip camera modules. The camera modules market with respect to different applications such as consumer electronics, healthcare, industrial, security & surveillance, automotive, and aerospace & defense, also has been analyzed and forecast in the report for the period between 2014 and 2020. This report on the global camera modules market analyzes the camera modules value chain to provide a clear insight into the various segments and stakeholders in the industry. The market has been segmented on the basis of component, process, pixel, application, and region. This report also evaluates market and technology-related trends, along with market dynamics such as drivers, restraints, opportunities, and challenges. The global camera modules market report profiles some of the key technological developments in the recent times. It also profiles some of the leading players in these markets and analyzes their key strategies. The competitive landscape section of the report provides a clear insight into the market share analysis of the key market players. The major players in the global camera modules market include LG Electronics Inc. (South Korea), Samsung Electro-Mechanics Co., Ltd. (South Korea), Sharp Corporation (Japan), Lite-On Technology Corporation (Taiwan), and Cowell e Holdings Inc. (China) among others. The global camera modules market is segmented on the basis of components into image sensors, lens modules, and other components. The camera modules market is segmented on the basis of process into two major categories, namely, COB (chip-on-board), and flip-chip camera modules. The global camera modules market is segmented on the basis of pixels into camera modules with different ranges of pixel count. The pixel matrix is one of the key metrics in the camera module performance which measures the image resolution in the camera modules. The global camera modules market is segmented on the basis of application into consumer electronics, automotive, healthcare, industrial, security and surveillance, and aerospace & defense. The global camera modules market is segmented on the basis of geography into four regions, namely, North America, Europe, Asia-Pacific, and Rest of the World. The geographical analysis in the report further divides North America into the U.S., Canada, and Mexico; Europe into the U.K., Germany, France, Italy, and Rest of Europe; APAC into China, Japan, South Korea, and Rest of APAC; and the RoW region into the Middle East & Africa and South America. Submarkets: Segmentation of the global camera modules market based on component, process, pixel count, and application. Market, by Application: Consumer electronics, automotive, healthcare, industrial, security and surveillance, and aerospace & defense. The camera modules market has been gaining momentum in the past few years because of the increasing demand for consumer electronics devices such as smartphones, tablet PCs, digital cameras, and others across all nations. The growth of this market is driven by the increasing trend of sharing images and videos using advanced media-sharing technologies which are the major aspect of social networking on a global basis within the smartphone and multimedia tablet ecosystem. Also, the enhancement in the image resolution of sensors along with the technological advancements in camera modules components and design is driving the camera modules market. Moreover, the growing market for advanced driver assistance systems (ADAS) in the automotive sector is boosting the demand for image sensors, and in turn, camera modules. However, the high power consumption of CCD image sensors, and the heavy maintenance and high cost of camera modules are some of the factors restraining the growth of the global camera modules market. Image sensor and lens module are the main components of a camera module. Image sensor is an electronic photosensitive device which is used to convert an optical image into an electronic signal. It consists of millions of photodiodes and acts as an image receiver in digital imaging equipment. It is widely used in digital cameras, camera modules, and other imaging devices. Analog sensors such as video tubes have replaced mostly by CCD (Charge-Coupled Device) and CMOS (Complementary Metal-Oxide-Semiconductor) image sensors. Currently, majority of the requirement of image sensors is met by CMOS image sensor, while CCD image sensor is used especially for high-end applications. CMOS image sensors are preferred over CCD image sensors owing to their low power consumption, ease of integration, faster frame rate, and lower manufacturing cost. The lens module selects the quality of light incident on the image sensor and is thus responsible for the overall quality of the final output image. Camera modules use a wide range of assembly technologies. The imager die can be mounted on either COB or flip-chip packages. Flip-chip camera modules are generally smaller than COB camera modules, but require higher-precision packaging technologies. Flip-chip camera modules require additional assembly steps and specialized equipment during the manufacturing process, which is not only time-consuming, but also makes flip-chip cameras more expensive. Some of the emerging trends in the this market include increasing the resolution and complexity of image sensors for better image quality, increased application of camera modules in machine vision, growth in 4K pixel, (4096 x 2160) and ultra HD technologies, and growing use of camera modules in ADAS systems among others. The market for camera modules in APAC is expected to grow at the highest CAGR of 12.1% between 2015 and 2020 to reach USD 15.48 Billion by 2020. The Asia-Pacific market of camera modules is growing rapidly as most of the camera modules manufacturers are located in APAC. Most of the demand for camera modules in APAC region is from the consumer electronics application including smartphones, tablet PCs, cameras, and others. With the inclusion of secondary cameras in smartphones, the demand for camera modules is expected to grow further. In addition, the development of advanced driver assistance systems (ADAS) for automotive application is also expected to boost the demand for camera modules in APAC. This report estimates the camera modules market size and forecasts the same for the major regions ,namely, North America, Europe, Asia-Pacific, and Rest of the World. It also analyzes the trends in the global camera modules market. The report further profiles the top 10 companies present worldwide in this market, along with their recent activities such as mergers & acquisitions, collaborations, joint ventures, and new product developments. The global camera modules market was valued at USD 19.21 billion in 2014 and is expected to reach USD 36.95 billion by 2020, at a CAGR of 10.8% between 2015 and 2020. This report describes the market trends and challenges pertaining to the global camera modules market and forecasts the market till 2020, on the basis of component, process, pixel, application, and geography. The report also features the detailed competitive landscape by identifying the key players along with their in-depth market share analysis in the global camera modules market. 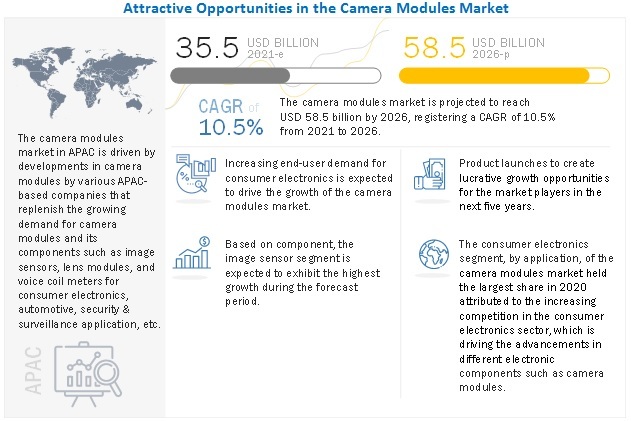 The sections and subsegments in the report also analyze the drivers, restraints, opportunities, and challenges in the market and the current market trends that are expected to have an impact on the global camera modules market. Some of the major players in this market include LG Electronics Inc. (South Korea), Samsung Electro-Mechanics Co., Ltd. (South Korea), Sharp Corporation (Japan), Lite-On Technology Corporation (Taiwan), Cowell e Holdings Inc. (China), Partron Co., Ltd. (Korea), Sunny Optical Technology (Group) Company Limited (China) Foxconn Electronics Inc. (Taiwan), Chicony Electronics Co., Ltd (Taiwan), and Toshiba Corporation (Japan) among others. The global camera modules market is expected to grow at a CAGR of 10.8% between 2015 and 2020. Camera modules are primarily used in consumer electronics, followed by the security & surveillance sector. in 2014. APAC was the largest market for camera modules, followed by North America. 13.3 Samsung Electro-Mechanics Co., Ltd.
13.6 Cowell E Holdings Inc.